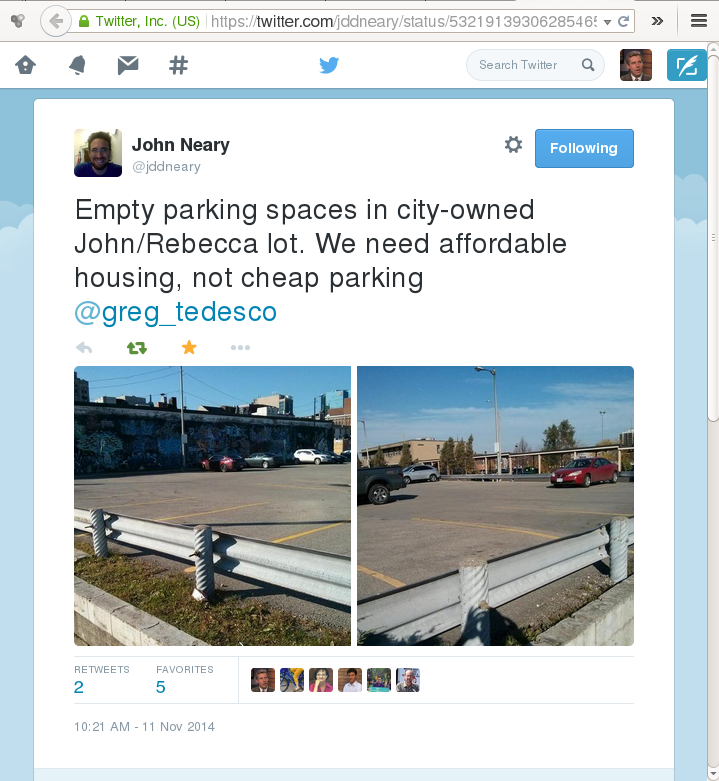 Ward 2 Councillor Jason Farr confirmed in an email to RTH this morning that most of the parking spots will be retained. The two-way conversion of Rebecca Street will no longer result in the loss of 13 parking spots. On October 31, the City announced that it will convert Rebecca to two-way between Wellington and John. The plan included removing 11 curbside parking spots in the block between Catharine and John. Last week, we argued that this is a bad idea. Curbside parking protects the sidewalk, and narrower lanes are safer than wider lanes because they discourage dangerous speeding. Please be advised (and feel free to share) that as it relates to the Rebecca Street conversion, we will be maintaining the parking metres between Catharine and John. With the exception of a few in the middle to create a gap and allow for east west passing‎. Though in most cases, east west passing should not be an issue. I went out today and measured the width of Rebecca at various points between James and Catherine. Granted that my measurements are somewhat approximate, the street is around 24-26 feet in width both east and west of John (it widens to around 30 feet closer to Wellington). 24 feet is plenty wide for two-way traffic and curbside parking - wide enough for two vehicles to pass each other next to a parked vehicle. It just means drivers have to slow down a bit when passing each other, which on a downtown side street is an advantage, not a drawback. On the other hand, 12 feet is far too wide for a vehicle lane on an urban side street. That's the standard lane width on the U.S. Interstate Highway system. Other cities are busy installing alternating "chicanes" - midblock bumpouts - on their side streets to slow traffic by forcing drivers to "slalom" and wait for each other to pass. We have to get in the habit of regarding street features that slow traffic as a good thing rather than a problem to be eliminated. It's nice to see the City changing its position on removing curbside parking. It would be even nicer to see the two-way conversion extended all the way to James instead of stopping arbitrarily at John. Rebecca's utility to drivers and cyclists is drastically undermined by leaving the last two blocks one-way. The only place Rebecca narrows appreciably from 24 feet is right at James, thanks to a curb bumpout on the northeast corner. However, the bumpout merely extends as far as the curbside parking would extend. Rebecca is still wide enough for two lanes - one to turn left on James and one to turn left or right on James. Given the low volumes of automobile traffic on Rebecca, it is unlikely to cause significant problems by making Rebecca two-way all the way to James. Drivers can slow down, negotiate and share the space, as they do successfully on streets across the city. Since Rebecca does not continue west of James (the exterior wall of the City Centre faces Rebecca), there should not be much involved in the signalized intersection. Cars going west on Rebecca already have working traffic signals, and cars going east on Rebecca will be turning from James, where they also currently have traffic signals. The reason for stopping the two-way reversion at John is almost certainly the same as the (abandoned) reason for removing the parking spaces between John and Catharine: slavish devotion to suburban design principles that consider the street to be too narrow for two-way traffic and curbside parking. For whatever reason, the initial decision was to sacrifice parking east of John and two-way traffic to the west. Of course, just as the roadway between John and Catharine can in reality accommodate low-speed two-way traffic and parking, so too can the roadway west of John. The utility of this conversion will also be hamstrung by the absence of a traffic light at John, but that's a fight for another day. Can we PLEASE fire the people who keep botching up any and every piece of urban infrastructure they are tasked with? This is embarrassing. keep going now you have cancelled bike lanes AND made rebecca street less safe for cyclists. Progress may not be perfect! But come on because the city doesn't move in lock step with your concept of perfection, is that a reason to hold back progress ? If there is enough room on Rebecca for parking AND two cars to pass each other in opposite directions, then there is enough room for cyclists to travel without being in the door zone. Cyclists are allowed to take the lane on a road like Rebecca --- they don't have to move over to allow cars to pass them in the same lane, as there really isn't enough room to do so safely, door zone or not. I don't see why they would have to ride in the door zone. so let's see if I understand. You're criticizing citizens for wanting parking to remain on quiet, slow-speed Rebecca street which will help keep traffic speeds low as they should be on that street, which also helps cyclists safey ride in mixed traffic. Your complaint is that 'dooring' may now become a problem on Rebecca. Also, you're criticizing citizens for halting bike lane projects on Herkimer/Charlton, two high speed, busy streets - because the bike lane was planned to be wedged perfectly into the dooring zone and next to live traffic. Hmmm, I'm no scientist but it would appear as though the better street to have cyclists and cars mixing would be Rebecca, especially with curb parking retained, which results in much slower driving speeds. And the one-way streets with more volume and speed, one would think cycling would be safer next to the sidewalk, protected from live traffic and dooring. But you want the opposite....in the name of looking out for cyclists?? By the way, there was never any proposal for bike lanes on Rebecca, as far as I am aware. The parking lots on either side of the street are a much bigger problem than the on-street parking. Keeping the on-street parking will make it harder for the city to justify keeping these unnecessary parking lots. Those lots are always full. What makes them unnecessary? That picture was posted on November 22, 2013. A Saturday, at 9:04 in the morning. Of course it's not full, the vast majority of the businesses in the area haven't opened for the day; and even then it's not a weekday which is when these lots are typically full. Go run to that same parking lot now and tell me it isn't full. Last year's Downtown Parking Update found that maximum downtown parking utilization is just 68 percent, and it's actually down from an earlier peak utilization of 76 percent in 2005. According to the study, once the lot at John and Rebecca is transformed into a neighbourhood park, the parking area around Rebecca will reach 84 percent peak utilization. Even if demand for parking continues to increase until the lots around Rebecca fill up, demand can be managed through adjustments to pricing. Right now, Hamilton has some of the cheapest downtown parking rates of any comparable city in Canada. There are literally whole city blocks where the only building is a kiosk to pay for parking. That's an appalling misuse of what should be some of the most valuable and desirable real estate in the city. We're squandering millions of dollars in annual municipal tax revenues by allowing these lots to remain at their lowest value of use. 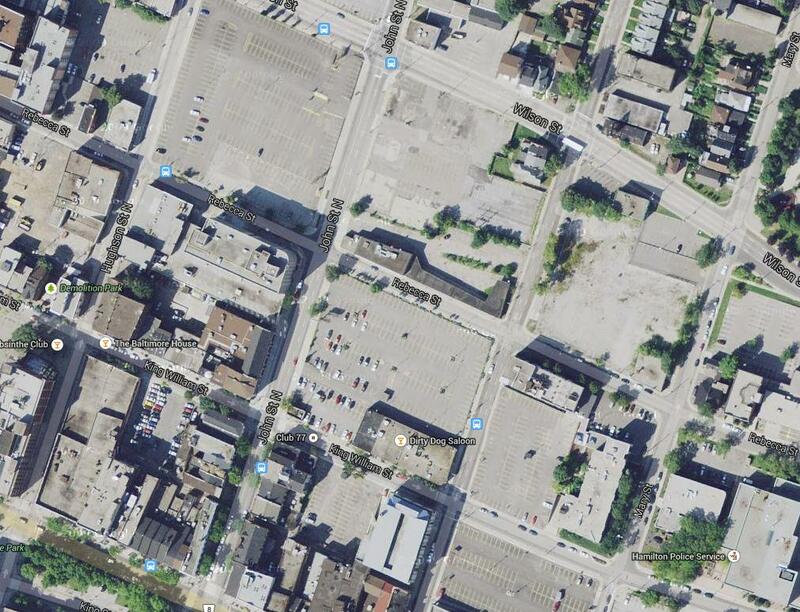 The fact that so many lots have remained as surface parking for so many years is a clear indication of the failure of current City policy to maximize our urban potential. My mistake: they aren't always full, but they are full weekdays during business hours. That picture says it's from 7:21am, not 10:20. Time displayed is clearly 10:21 AM. My screen shows the 7:21am timestamp...but the sunshine doesn't lie! Still, interesting that we're getting different timestamps on the post. Logged out of Twitter, it showed 7:21AM, which means it defaults to Pacific. Once logged in, my profile's EST setting took effect and it showed 10:21AM as alleged. However I had to clear Firefox' cache before this specific tweet refreshed to our timezone. All makes sense! So I made an API call to Twitter to get a JSON dump of this particular tweet. You can see the full JSON object here. The "created_at" field has the value "Tue Nov 11 15:21:30 +0000 2014". John Neary's user profile is defined with a "utc_offset" value of "-18000". This is an offset in seconds from Coordinated Universal Time (UTC), which for practical purposes is equivalent to Greenwich Mean Time. The offset of -18000 seconds corresponds to -5 hours, which places us into Eastern Standard Time (EST). So the UTC timestamp of 15:21:30, minus five hours, gives us 10:21:30. If people are seeing different displayed times for the status on twitter, it might be because their user profile has them in some time zone other than EST. It was 7:21 AM, Pacific Time, when John's tweet was posted. Twitter is based in San Francisco, so I expect you're right about the site defaulting to its own local time zone for people who aren't logged in. Wow. This is quite the convo. Maybe tomorrow everyone can glance outside at 7:20 and look for the booming, bright sun as evident in this pic. Geez. These parking lots are mostly empty 365. Thanks for chiming in. You added a lot there. Please keep the conversation going! The photo I linked above was taken on a weekday during business hours. According to last year's Downtown Parking Update, peak utilization in the lots around Rebecca won't even reach 84 percent until after the lot at John and Rebecca is turned into a park. Even with some of the lowest prices in Canada, downtown Hamilton has a glut of excess parking capacity. The opportunity cost in lost economic activity and municipal revenue is devastating. absolute worst possible use of urban land: parking lots. Fill them with mixed-use buildings and add in a few strategic parking structures and downtown will come back to life with actual human beings on the streets, not empty slabs of blacktop. Also, from what I understand, the park isn't happening at John/Rebecca any longer. Yes, I heard the park isn't happening because of the Shwarma business on one corner. That area needs some green space, and less asphalt. Honestly, what that area really needs is some buildings. It's the heart of the downtown core. Gore Park is a couple of blocks to the southwest and Beasley Park is a couple of blocks to the northeast. A park beats the current parking lot but a developed urban block would be even better. I've always liked the idea of expanding Beasley Park across Wilson towards the John/Rebecca Park. And save the other lots to the west, north and east for new development around the park. hey, thanks for the heads up on the dutch method of car door opening. thats a great idea that should be shared more widely. i'm going to try to practice that from now on. (p.s. the rest of your comment completely misses the point of including the street parking which was elucidated quite clearly in the article. and no, obviously, if you had read the article, they have not "(held) back progress." Will there also be sufficient space to safely walk a Unicorn? After all this is Hamilton, the unique city of harbour and escarpment. No, it simply demonstrates that that was the first opportunity I had to walk past that lot after the publication of Ryan's article. In any case, suppose that the lot is usually full on business days. Congratulations, you've just proved that there is demand for artificially cheap parking. What a great way to build a downtown. Oh, wait. In that case I was referring to the Saturday photo; you're right. I usually don't take these photos on weekends because somehow a parking lot that is used 40 hours per week is seen by many people to be an acceptable downtown land use, and when I looked up that old photo I forgot that it was from a Saturday. In any case, my other photos from today are obviously from business hours on a weekday. Doesn't really affect my point. Yes it is a bank holiday but only federal employees are off today, not municipal. All anecdotes aside, the City's own Downtown Parking Study found that peak utilization downtown is just 68 percent, and that even if the parking lot at John and Rebecca is turned into a park, the parking in that part of downtown will only have a peak utilization of 84 percent (which means it's lower than that now). And that utilization is in the context of parking rates that are considerably lower than in comparable cities. Oh, wait, this is Hamilton; there are no comparable cities. It's also strange that this debate started because Ryan and I campaigned to keep the on-street parking. Indeed. My interest in on-street parking on Rebecca is not about ensuring there is enough parking downtown - there is way more than enough parking downtown. My interest strictly concerns the role of curbside parking in narrowing the lanes, which reduces vehicle speeds, and physically protecting the sidewalk.